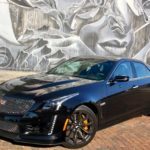 CADILLAC CTS-V: FEEL THE FORCE! CADILLAC RACING: BACK ON TRACK! 2017: IS THERE A BMW M7 IN YOUR FUTURE?